Northern Wilderness Outfitters has been the first choice in outfitters for many families, groups and organizations. With over fifty years of guiding and outfitting, our expertise ensures that your Algonquin experience will be most enjoyable and memorable. 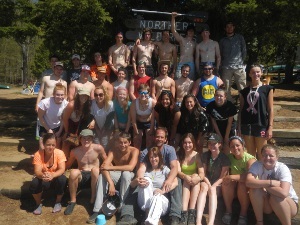 Northern Wilderness Outfitters offers group rates and packages for larger organizations looking for an outdoor educational experience in Algonquin Park. We have planned trips for schools, churches, tour operators, the armed forces and Scouting groups - we can plan your trip too. Recently, we have added private hiking trails and an Education Centre to the property. This has been popular with schools looking to include more diversity to their outdoor education curriculums. It has also been very popular with groups during our winter programs. For each group we take the time to ensure the activities and course content is suited to the expectations of the administration. For more information on special group rates, contact Northern Wilderness Outfitters at info@northernwilderness.com and we would be happy to send you more information and prices. Please include as much information about your groups as possible. If you have a preset idea of the curriculum and activities already let us know. Remember our maximum capacity in the spring and fall is 80 people, Summer is 120 people and in the winter is 45 people.